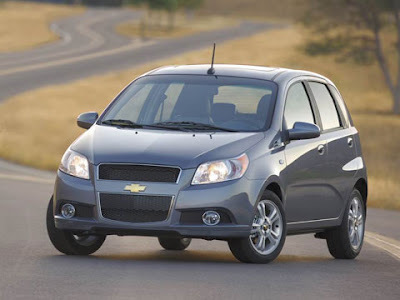 According to Reuters, Chevrolet won't be offering a replacement for the Aveo until January,2011. The original replacement date was April, 2010. Of course, this is all due to GM's financial issues. Sales of GM Daewoo products, the General Motor's South Korean arm, are down nearly 45% from this time last year. This is compared to an 11.8% drop from Hyundai (now the world's fifth largest automaker) and 14.5% drop from Kia. Reuters also reports that Hyundai is trying to use this opprotunity to take a chunk out of GM Daewoo's market share. Fully story in the link below. Ouch. The Aveo is just barely a good enough car to have on sale in the relatively competitive small-car market. It eats away at Chevy's reputation. Fiesta's gonna eat it's lunch. I really want to drive a newer one, actually. I drove the last generation and wasn't happy with it at all. It felt very cheap. I sat in a G3 at the autoshow this winter and it didn't seem that bad. So it'll be Aveo vs. Fiesta for a whole year.